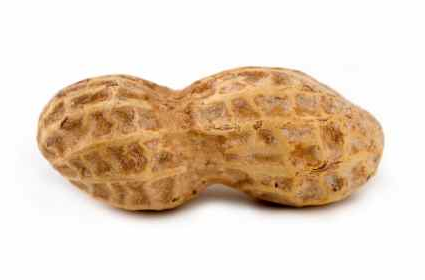 This is National Peanut Month, although I’m not sure why we have a national peanut month, other than to say it started in 1941 as a week-long observance, thirty-seven years after peanut butter was first introduced at the St. Louis World’s Fair. In 1974, the year I graduated high school, it was expanded to include the entire month, several years before Jimmy Carter, who was was a peanut farmer, was elected to the presidency, so we can’t blame it on him. This week my goal is to encourage people to eat more green foods, since green foods are our nutritional powerhouses, and since it’s almost spring, and Monday was St. Paddy’s Day, and, well, you get the rest. Which means today’s recipe should be all about combining something green with peanuts. Except that Blue Moon Vegetarian doesn’t have a recipe that includes both greens and peanuts–unless you count the peanut butter version of Protein Balls—which contains a hefty dose of hemp protein powder, which is, rather obviously, green—and which it just so happens I have now translated into a vegan, gluten-free recipe called CHOCOLATE-COVERED GOOD-FOR-YOUR-HEART-AND-BRAIN PROTEIN BALLS. The good-for-your-brain part comes from the medium-chain fatty acids (MCFA’s) in the coconut flour and coconut sugar. MCFA’s are quickly and easily broken down by the digestive tract, which makes them a good energy source. They also don’t stick to your blood vessel walls the way saturated fats do, and there is also some implication that MCFA’s are useful in the treatment of Alzheimer’s. The good-for-your heart part comes not only from the fiber and antioxidants in the dried fruit, but from the peanuts (which are not actually nuts, but legumes, so, technically, they are seeds) which also include powerful anti-oxidants, and from the hemp protein, which includes a kind of fiber that transports cholesterol out of the body. Okay, maybe that recipe’s name isn’t going to stick, but it describes what I love best about these compact health-boosting snacks: they taste so good that your brain thinks it’s getting candy, but they so nourish your heart, mind, and soul that you have no urge to Hoover more than just a few, which is a good thing, because three of them have as many calories as an actual candy bar, but also almost as much protein as a small steak and as much good-for-you fat as a full serving of tofu. Make certain, however, that you grind your peanut butter fresh yourself at the grocery store—buy in bulk and grind your own in the food processor—and make sure they are organic. Non-organic peanuts contain a high level of pesticides, and un-refrigerated peanut butter grows aflatoxins, which are known carcinogens. Prepare cookie pan or pastry sheet by lining with waxed paper or parchment paper. Melt coconut oil and set aside on a towel so it stays warm. In a food processor, mix nut butter, oat bran, coconut flour, hemp powder, coconut sugar, currants, cranberries, sunflower seeds, and salt. Add teaspoons of melted coconut oil as needed to create a moldable but not sticky dough. Grease hands with small amount of coconut oil. Roll mixture into 1-­inch balls. In a small pan over low heat, melt chocolate chips in the leftover coconut oil and stir until all lumps disappear. * Dip balls into mixture until well coated. 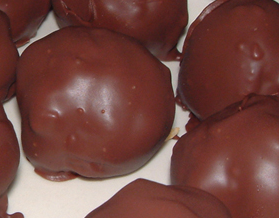 Place balls on wax paper and allow to rest in refrigerator until coating is set before eating. Store in the refrigerator for up to two weeks.